How many shoes does a minimalist own? Minimalism isn’t about having the absolute least amount of stuff that is humanly possible. It’s humanly possible to never leave the house ever and just go barefoot inside all the time. No shoes and no socks. No, minimalism is having what you need and no more. And it doesn’t exclude collections, though hopefully it can help you to reconsider the importance of having stuff for stuff’s sake. Some people have large shoe collections. It’s okay to love shoes. To be a minimalist who loves shoes only means that you take excellent care of the shoes you have and you only collect shoes you wear and that are comfortable and meet your needs. I am not particularly into shoes, so it is easier for me to detach from shoe-mania and stick to what I know works. For me, this means good arch support and no high heels. For you, it may mean something completely different. Recently, I had a friend visit my apartment. We had talked briefly about my minimalist lifestyle and she was flabbergasted that I had so few things. She joked (or perhaps it wasn’t a joke) that everything in my whole apartment was less than she had in her bedroom. She was amused, and then she looked on in almost-horror when she saw my shoes. “Those are all. The shoes. You own,” she said. My six pairs of shoes. If I remember correctly, I had at least ten or twelve pairs of shoes when I initially purged my wardrobe. As of this post, I own six. Brown heels: I haven’t worn these in months, and they survived the purge because they “go with my brown dress pants,” which I also haven’t worn in months. Brown sandals: I have been wearing the brown sandals while the weather has been warm (even with black clothes, since I didn’t get around to replacing my black sandals that died). Walking shoes: I wear these for exercise or days I will be on my feet a lot. Black boots: I will definitely wear these when the weather gets cooler, as I wear them with dresses and leggings as well as with pants (casual or dress). They are also very good and reliable bug-killing shoes. 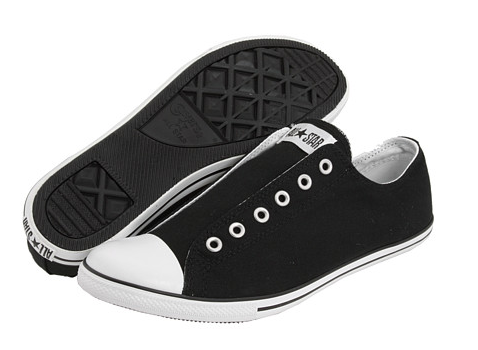 Converse (Black hi-tops, blue low-tops): Upon wearing these, I noticed immediately how old and worn out both pairs are, and I plan to replace them both with one pair of Converse slip-ons in black or grey. These are not the most versatile or practical shoe but they make me happy, and that means they still deserve a spot. Rainy days mean I can wear a fun color in my boots. How many pairs of shoes do you own? Do you have a favorite shoe you recommend? I have 6 pairs also: barn/riding boots, fuzzy warm fake Ugg boots for winter (not barn boots), 2 pairs of tennis shoes (1 that’s ok to get nasty at barn and a cleaner pair for other outings), and 2 pairs of fancier flip flops (1 brown, 1 black) for dressier or fun occasions. I hardly wear dressy stuff but I’m still holding onto those brown heels, so I understand! I have two – invisable shoes and winter (waterproof) shoes. I have always had problems finding shoes to fit which don’t rub. My invisable shoes are great as I can wear all day, walk for miles in them and never have problems. I must know more about these shoes! I have 7. I mostly alternate between my black and tan flats for work. Also I have one pair of athletic shoes I barely wear, denim colored slip on shoes, black flip-fops, black and white polka dot rain boots, and black knee high boots with a small heel which I still try to kill myself every time I wear them. I would like to get rid of the boots and find a more comfortable one, and find a low heel dress shoe for work. Sounds like a good mix! Good luck finding a more comfy boot. I have given up high-heel boots, I always feel like I’m wearing little stylish death traps. 🙂 let me know if you find a good replacement! 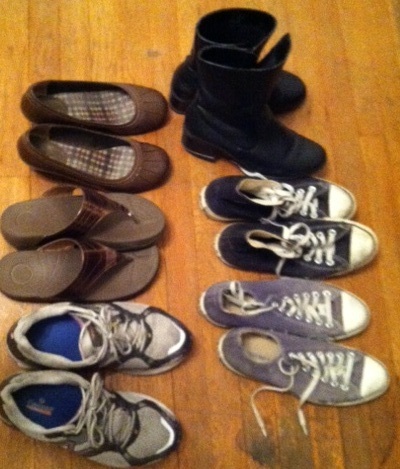 Two pairs, though I lead a pretty casual life and live in Montana, where almost everyone dresses functionally. KSO Trek Vibram Five Fingers. The brown leather is more subtle than typical VFFs, though unfortunately they still draw a lot of attention. North Face boots. They go on when it snows and come off when the temperature is above 40F. If I needed anything else it would be one pair of brown dressier shoes, probably something from Vivo Barefoot. Good words to live by! Thank you for commenting 🙂 I’m interested in Vibrams but I don’t know much about them. They definitely grab attention, I know what you mean! As I have started to slowly downsize my wardrobe, I find this a very interesting topic. I am a shoe lover, but luckily a very picky one. 🙂 And my favorite brand of shoes – Camper, a Spanish brand that makes very cool and very good quality shoes – isn’t really cheap, so I only buy them during sales or at outlet stores. Still, I agree that “to be a minimalist who loves shoes only means that you take excellent care of the shoes you have and you only collect shoes you wear and that are comfortable and meet your needs”. For my job, I need to go to clients now and then. That requires some formal clothes and shoes. I also believe that it’s good for your shoes and your feet to regularly wear different shoes. 12 pairs of shoes that meet pretty much any occasion: to me, that sounds like a pretty minimalist shoe collection. Indeed it does sound like a pretty minimalist collection! I like the strategy of wearing down the collection and then not replacing some pairs. I sold some nearly-new pairs at a yard sale and tossed the more worn out ones from my collection when I did my purge. SHOES!!! Ummm. Trying to count here. Brown heels, 2 pairs of brown sandals, 2 pairs of black heels, black sandals, black tennis shoes, red tennis shoes (with heels! ), beige tennis shoes (with heels! ), brown boots, 2 pairs of black boots, gray boots, pink boots, gold flip flops, gray flip flops, white flip flops, red flip flops, green flip flops, yellow flip flops, pink flip flops, blue flip flops, purple flip flops, red heels, yellow flats, cream flats … Now I want to go shoe shopping. I think you’ve had enough 🙂 Do you really wear all of those?? Also… I will see you soon! Sadly, yes, I do, for the most part … except some of the flip flops. And also the beige tennis shoes with heels, but they are cute and they were free, and I haven’t had them that long, so give it time LOL. I think everyone I’ve ever lived with, however, would appreciate it if I cut down on shoes, as they tend to take up a lot of room. 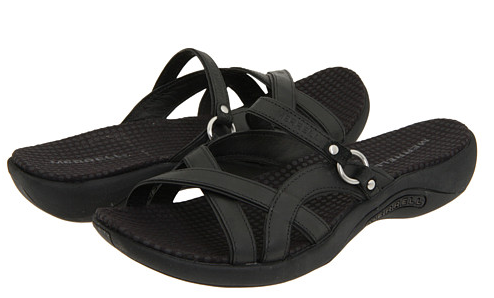 In summer the black heels and boots are replaced by summer office sandals (2″ heel, slide on, one black, one white). Outdoors – duck shoes (slip on rubber shoes) and 2pr snow boots (sensible doc martin style and dressy kneehighs with a heel). I don’t really consider snow boots as shoes. When its -40 I don’t care what they look like, it’s all about function and warmth. So I have twice as many shoes as I need- but I think I am going to go with the ‘not replacing them’ method…and if I do need to replace things, go for something multifunctional! Wow, 20! Those all sound like useful and/or really cute shoes though, and as long as you wear them all, I think you’re good to go. 🙂 Thank you for commenting! I’m a little envious of your purple sequin ballet pumps. I do wear most of them..there are a few I need to make an effort to wear more offen though – and work out if there is a reason I dom’t wear them often, i.e. they are uncomfortable. Purple sequin pumps were cheap, looking a little battered now. But still so cheerful! I actually have more pairs of shoes/sandals than I need, but that’s because I’m planning to wear them out until they are rotten enough to toss them. And with four seasons and very unstable weather it’s just better to have two pairs of the more important shoes, and really warm winter boots are necessary though only worn a few days each year … I guess all in all it’s about 15 pairs of shoes, if you count flip-flops and slippers. Hey, as long as it works for you and you actually wear them! 🙂 I had shoes I really wasn’t wearing so I tossed them. For example, the strappy sandals I wore to my high school graduation… yikes. As of yesterday, I have 6. Black rain boots (used as winter boots with extra socks), brown casual boots, black ballet flats, gray low-top converse, brown sandals and navy flip flops. I need to replace my ballet flats and converse as they have seen better days. I’m also on the search for the perfect pair of comfortable kitten heels for weddings/special occasions. If my sister had the same sized feet as me, I’d never need to buy shoes again. She could open a shoe store with her supply. For reals. I’m not totally sure since I haven’t seen my winter collection in awhile.. but my guess is 20ish. I actually was going through them the other day, kind of. I need to get back to that ! There are so many I NEVER wear. Like the new home page by the way!! Counting your every-day things is always fun, so here goes. I’ve got 11 pairs of shoes at the moment, and that’s including skates and slippers 😉 Apart from those two, I have winter/hiking shoes(the same pair acts as both now), 2 pairs of boots, wellies, 2 pairs of work shoes, sandals and flip-flops. All in all, I don’t usually buy new shoes, unless something has to be trashed, but the ‘extra’ pair of work shoes still has some ‘mileage’ left to them – and the new ones were really cheap, yet good – and one pair of boots gets too little use but are so beautiful that won’t easily get axed. I like the new look, too! I’ll be buying some shoes soon, I think, because those two pair of Converse are both falling apart, and I have no winter shoes at all, and the cold weather is coming! I appreciate any recommendations. Oops, did I count wrong? I was never very good at maths…It seems that I own 10 pairs of shoes, not 11! Woah – I thought I was doing pretty good keeping my shoes to about 10-12 pairs… I go to dressy occasions regularly, so I need my 4 pairs of dress shoes (LOVE strappy heels 🙂 – white, two black, and one brown). I have cowboy boots, hiking boots (athletic shoes don’t cut it for backpacking sometimes), two pairs of running shoes (used every other day, the shoes last longer and with the price they cost, I’m gonna get as much wear out of them as I can! ), dressy flip-flops which I need to toss because they are falling apart, one pair of blue dressy/casual flats which need to be replaced, and I mooch crocs from family members when I don’t feel like doing yard work barefooted. Mooching is a great way to keep the count down 🙂 Haha! As long as you actually wear them and use them, there’s nothing wrong with having a bigger collection. Each person’s minimalism is different 🙂 Thank you for commenting and sharing your count! I have six pairs as well. Seems to be a well rounded number for every situation. I always hoped to get down to two pairs, but every time I look look at my shoe pile we have this mini little conversation, “Surely I don’t need that pair!” “yes, you need me for the snow!” “Ok well I don’t need workboots anymore” “you can’t get rid of me! they won’t let you on the construction site without boots.” and so on. So I’m at a stalemate with the shoes for now. It’s a pretty healthy stalemate! I once was helping someone de-clutter and she had 50 pairs of black heels, none of which she was willing to discard. She said she wore them all. I was totally flabbergasted!